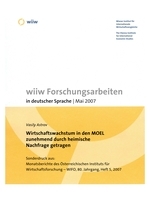 Die Konjunkturbelebung in der EU 15 trug 2006 zu einer Beschleunigung des Wirtschaftswachstums in den MOEL bei. Während in den neuen EU-Ländern in Mitteleuropa der Außenhandel kräftig wuchs und eine weitere Aufwertung bewirkte, geht die Dynamik in den meisten anderen MOEL vor allem auf die hohe Verschuldungsbereitschaft der privaten Haushalte zurück. Die Lage auf dem Arbeitsmarkt entspannte sich in den neuen EU-Ländern weiter, der Strukturwandel ist dort weitgehend abgeschlossen. In den Westbalkanländern verschlechterte sich die Situation jedoch zum Teil sogar. Die Performance der russischen Wirtschaft hat sich von der Entwicklung der Weltmarktpreise für Energie weitgehend entkoppelt; in der Ukraine schwankt das Wachstum dagegen erheblich und nicht zuletzt durch politische Faktoren bedingt. The economic recovery in the EU 15 in 2006 resulted in an acceleration of growth in Central and Eastern European countries (CEECs), particularly in the new EU member states of Central Europe. Helped by the recent massive inflows of FDI, these countries have become serious competitors on the European markets, particularly those of manufactured goods. The continuous nominal currency appreciations in Poland, the Czech Republic and Slovakia reflect their gains in international competitiveness and will not affect their economic growth. In contrast, the contribution of foreign trade to growth was decidedly negative in most other CEECs, including the Baltics and the new EU members in Southeast Europe. Their growth rates - quite high in some instances - were first of all due to a boom in private consumption, largely financed by external borrowing facilitated by the dominance of foreign-owned banks. In some cases, the credit boom is about to overheat and produce 'bubbles', especially in real estate. However, the available policy options are limited: while monetary policy is constrained by fixed exchange rate regimes, fiscal policy is already quite restrictive in general. In the new EU member states, the labour market situation is continuing to improve given that their industrial restructuring is nearing completion, and not least due to the sizeable outward migration flows. In the West Balkan countries, on the other hand, unemployment rates are generally high and rising. Their recent progress towards EU integration has been generally modest, even though greater political stability and growing foreign trade both support their economic recovery. With the exception of Hungary (where large-scale efforts at fiscal consolidation have induced a noticeable economic slowdown), short- and medium-term economic prospects for the CEECs are positive, whereas growth in Serbia and Ukraine remains relatively vulnerable to political risks.